It's a battle with a Spanish flavor! Two Catalan coaches face off as Sergio Lobera heads to the Kanteerava to face Carles Cuadrat's high-flying Blues. Get your tickets, be loud and be proud! In order to maintain the high quality of user experience, Bigtree may collect certain information (including but not limited to personally identifiable information) from you such as name, e-mail address or telephone number at the time of booking/registration/payment. By agreeing to these Terms and Conditions, you hereby give your consent to Bigtree to collect, receive, possess, store, deal and handle all information as provided herein for its own purposes. This Match Ticket has been issued by the Company and is valid for one (1) person only, i.e. the Ticket Holder. Purchase and/or use of this Match Ticket is available only to persons who can form legally binding contracts under applicable law. Persons who are “incompetent to contract” within the meaning of the Indian Contract Act, 1872, including persons below the age of eighteen (18) years are not eligible to purchase or use this Match Ticket. However, a person below the age of eighteen (18) years may be permitted to enter the Stadium subject to (a) her/him being accompanied by her/his legal guardian and is under direct supervision of such legal guardian at all times inside the Stadium; and (b) such legal guardian is holding a valid Match Ticket on her/his own behalf and another valid Match Ticket for such person who is above the age of five (5) years and below the age of eighteen (18) years. If a person is below the age of five (5) years, she/he will not be entitled to a separate seat unless such person’s legal guardian is holding a valid Match Ticket for such person as well. The Ticket Holder agrees that in the event she/he brings any person who is below the age of eighteen (18) years into the Stadium, she/he shall be liable for the safety of such person and the Company, the Club and their representatives shall not be held liable in any manner whatsoever for the safety of such person and such Ticket Holder shall indemnify the Company from any claims in this regard. This Match Ticket must be produced by the Ticket Holder at the time of entry into the Stadium. The entry gates to the Stadium will open two (2) hours before the start of the Match on the Match day. Entry to the Stadium for the Ticket Holder will be refused if this Match Ticket has been torn, defaced or damaged or tampered with in any manner. No re-entry will be allowed for the Ticket Holder once the Ticket Holder leaves the Stadium, except where the Club expressly approves such re-entry subject to the Ticket Holder’s compliance with all relevant re-entry procedures, including without limitation, production of a re-entry ticket, out-pass or other proof of prior exit along with this Match Ticket, as may be required by the Company, the Club or their representatives at the Stadium. Entry will be refused to any person who attempts to use the same Match Ticket on more than one occasion at the same Match. 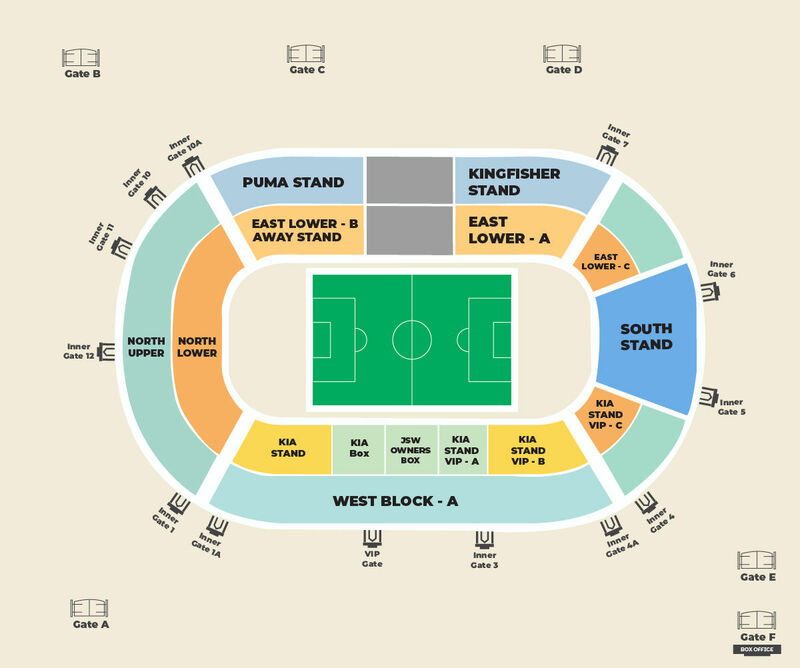 This Match Ticket only entitles the Ticket Holder to access the area of the Stadium in which the designated/corresponding seat is located and no other area of the Stadium. This Match Ticket will be valid until the Match has been completed or is reasonably deemed by the Club to have been completed. This Match Ticket may not be exchanged or used for any Match or event other than that indicated thereon. The Ticket Holder shall not use, alter, copy or otherwise deal with any of the symbols, trademarks, logos and/or other intellectual property appearing on this Match Ticket. The Company reserves the right to make an alteration to the times, dates and venues of the Match or to substitute the seat or area to which this Match Ticket refers at its reasonable discretion. If the Match is canceled or curtailed for any reason, there shall be no obligation on the Company to reschedule the Match. The Company does not guarantee that the Ticket Holder will have an uninterrupted and/or uninhibited view of the Match from the seat provided nor does the Company give any warranty as to the quality, content or duration of the Match. This Match Ticket must be produced whenever demanded by the Company, the Club and /or their representatives or stewards. The Ticket Holder must comply with any reasonable instruction from an officer, steward or security officer at the Stadium. The Company reserves the right to search or frisk the Ticket Holder (including the Ticket Holder’s bags, clothes or other possessions) prior to entry into the Stadium. Should the Ticket Holder refuse to be searched, the Company reserves the right to refuse admission or eject the Ticket Holder from the Stadium without any refund. Bottles, lighters, tins or cans, musical instruments, flammable, toxic, illegal or hazardous substances, metal containers, firecrackers, weapons or any articles that might be used as weapons and/or compromise public safety are not allowed inside the Stadium. Save for official Club merchandise and/or other football related clothing worn in good faith, any Ticket Holder who brings into the Stadium, uses, wears or displays any item, including without limitation, clothing, fan merchandise, banners or flags, which, in the Club’s view, may conflict with or in any way detract from the rights of any official sponsor, licensee or partner of the Club, will not be allowed into the Stadium. No alcohol may be brought into or taken out of the Stadium and no food may be brought into the Stadium. The consumption of alcohol may be permitted only in the authorized designated areas or places in the Stadium during hours determined by the Club, which reserves the right to close or restrict entry to any such authorized designated areas at any time. Alcohol will not be served to any Ticket Holder under the age of 21 years. The Company, its representatives and its sub-contractors have the right to ask the Ticket Holder to produce her/his government-issued photo identity card (which has her/his date of birth on it) to show that she/he is 21 years old or older. The Company shall be entitled to seize any prohibited items (as outlined in paragraphs 13, 14, 15 & 16 above) without liability and without any obligation to return such items or to compensate the Ticket Holder in respect thereof. This Match Ticket is strictly non-transferable and may only be purchased for personal, non-commercial use, and to be used by the Ticket Holder. The benefit conferred by this Match Ticket is personal to the Ticket Holder. This Match Ticket shall not be exchanged, ceded, sold or transferred, whether in a commercial or promotional context (such as, without limitation, as a prize in a lottery or competition or as part of an advertising or promotional campaign), with or without consideration, unless written permission has been previously obtained from the Company. Mobile telephones and cameras (non-DSLR) shall be permitted within the Stadium, provided that they are used for personal and private use only. The use of mobile phones, transistors, computers, cameras or any other audio visual recording equipment, for recording and/or communication of Match details, text, statistics, images, results, commentary, etc. for any commercial purpose is strictly prohibited. The Ticket Holder acknowledges and consents to the recording of the Ticket Holder’s likeness and/or voice without compensation and hereby agrees that the Company is entitled to use and sub-license all rights in respect of such recordings without compensation to the Ticket Holder. The Ticket Holder may not sell or offer for sale any product or service from any part of the Stadium and may not distribute or give away any free item(s) or any political, religious, charitable, commercial, advertising or promotional material(s) from any part of the Stadium. The Ticket Holder shall not engage in any form of “ambush marketing” and shall not conduct any activity that conflicts with, detracts from or infringes the rights of any official sponsor, licensee or commercial partner of the Club. Foul, abusive or any form of discriminatory language (whether on the grounds of race, religion, sexual orientation or otherwise) whether orally or through written materials such as banners, posters, placards, etc., unruly language or any unruly or threatening behaviour will not be tolerated at the Stadium prior to, during or after a Match. Entry by the Ticket Holder onto the field of play at the Stadium or any area not assigned to the Ticket Holder by the Match Ticket, at any time prior to the Match, during the Match and/or after the Match, and the throwing of any article within the stands or onto the field of play is strictly prohibited. The Ticket Holder is hereby advised that use of any of the language or the behavior referred to in paragraph 24 above or any action in breach of paragraph 25 will result in ejection from the Stadium and possible further action such as criminal prosecution, identification by way of photographing and/or capturing by video camera of the images of such persons and life-bans for all the Club’s matches and matches at the Stadium being imposed on such persons. If the Ticket Holder acts, or incites others to act, in such a way so as to cause the bringing of disciplinary action against the Club or the Company by any football authority, including, but not limited to, the Fédération Internationale de Football Association (FIFA), the Union of European Football Associations (UEFA), the Asian Football Confederation (AFC), the All India Football Federation (AIFF), the Karnataka State Football Association (KSFA) or the Bangalore District Football Association (BDFA), the Ticket Holder shall be liable to the Company for any loss thereby suffered by the Club or Company. In addition to these terms and conditions, entry to the Stadium shall be subject to any ground regulations specific to the Stadium. Such ground regulations shall be displayed at the Stadium. Entry into the Stadium using this Match Ticket constitutes and evidences the agreement by the Ticket Holder to be bound by these terms and conditions and by any Stadium regulations, which may be displayed at the Stadium, together with all applicable present and future laws, rules and regulations. The Company does not guarantee that the team for the Match will necessarily only be selected from the Club’s regular first team players. The team manager may consider it desirable on occasions to omit regular first-team players and select the team from the full playing squad. The Company will not be liable to the Ticket Holder whether in contract, tort or otherwise for any indirect, incidental, special or consequential loss or damage or for any loss of profit or revenue, loss of use, loss of business or contracts or loss of opportunity arising out of or in connection with the Match, howsoever caused. The total liability of the Company to the Ticket Holder for all liabilities arising out of these terms and conditions or in connection with the Match or Stadium, howsoever caused, be it in tort or contract, is limited to the amount paid by the Ticket Holder to the Company for the Match Ticket. The Company will not, subject to any limitation imposed by law, be in any way liable to the Ticket Holder for any event, occurrence, or other thing the cause of which is beyond the reasonable control of the Company, including, without limitation the abandonment or postponement of the Match due to weather conditions or due to any direction received from the AIFF, FIFA or AFC. Ticket Holders shall, however, be entitled to attend any re-arranged/re-scheduled version of the Match at a later date at the Stadium. Further, the Ticket Holder acknowledges and agrees that she/he will be watching a sport at the Stadium and there is a possibility that she/he might get injured or hurt due to the sport being played at the Stadium. The right of admission to the Stadium using this Match Ticket is reserved at the reasonable discretion of the Company. The Company reserves the right, without refund or other recourse, to refuse admission to or eject from the Stadium the Ticket Holder, if the Ticket Holder is found to be in breach of these terms and conditions or otherwise, misuses the Match Ticket. These terms and conditions shall be construed in accordance with the applicable laws of India. Subject to the arbitration provision in paragraph 35 below, the Courts at Bengaluru, India shall have sole and exclusive jurisdiction in any proceedings arising out of these terms and conditions. Any dispute or difference either in interpretation or otherwise, of any terms of these terms and conditions including but not limited to the Match Ticket, shall be referred to and finally resolved by arbitration under the Arbitration and Conciliation Act, 1996. The number of arbitrators shall be three (3): one (1) each nominated by the Ticket Holder and the Company and the third arbitrator chosen by the two (2) arbitrators so nominated. The above arbitration shall be conducted in English and the arbitration shall be held in Bengaluru, India.